Very weird bar. It has a main bar area and then a separate upstairs bit which I am sure is owned by the same owners but seems totally different. We stayed in the main bar and I'm sad to say that I was disappointed. It was a place my friend and I supped up our drinks as quick as we could in order to move along, dead atmosphere, felt likejust a room to drink in. Thought I'd try this place on the basis of its location overlooking Williamson Sq. Unfortunately, although the interior is pleasant enough it lacks any character, the beer is nondescript and the choice of music (mostly piped 80's shite) absolutely dire. I had no choice but to guzzle my bottle of Peroni, admit defeat and adjourn to the nearby Excelsior. Will not be coming back anytime soon. A wasted opportunity. I'm always on the lookout for new pubs in Liverpool I haven't yet done. So I thought I'd give this place a try yesterday. 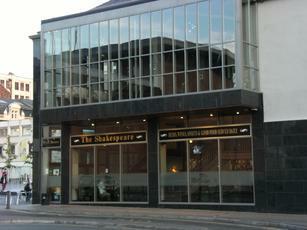 It's on a corner of Williamson Square and has more seating outside overlooking the square than inside. Service was efficient. It was busy, with seating at a premium. No cask ales are available, just keg options - Tetleys Dark Mild & Extra Cold, Guinness, Carling, John Smiths Extra Cold, Strongbow, Carlsberg, San Miguel & Coors. I think I'm scraping the barrel with my tour of Liverpool pubs now. But there may still be scope to go a little lower! Visited here a while ago for the first time. Had a decent, cheapish pint of Bombardier. Was put off though by the bland, modern interior of the pub. The ground floor is glass fronted and you as though you're on show to the outside world. I sat upstairs, which also has floor to floor windows, and sat myself in a corner, surrounded by people eating from the bland looking menu. More like an upmarket Wetherspoons and not very relaxing. Will not be returning! This pub has been recently "Done up" They should not have bothered. No atmosphere and rubbish ale. A typical "Bottle bar"